Those of you who follow my Instagram may have noticed that once again, my skincare routine has decreased in complexity. Since my first trimester sensitivity to smells kicked in, I found that even my lightest-smelling products would sometimes bother me. I had to pare my routine down to simple basics that would provide hydration and nourishment, without aggravating my nose on a regular basis. Seriously, I thought I was sensitive before, since I’m prone to migraines, but it’s nothing compared to pregnancy nose. So I thought I’d share what has been working for me, along with a bit about fragrance-free vs. scent-free. As usual, I focus my routine on proper cleansing, hydration, and nourishment, without too many frills. Since my scent-sensitivity has started calming down again in recent weeks, I’ve been able to add back in a few fun new products, although I still stick to pretty minimal, soothing products. My superstar duo is the Alkimi Cleansing Melt and Jordan Samuel Matinee Gel Cleanser. I use them for a double-cleanse in the evenings and use the Matinee cleanser alone in the mornings. My scent aversions became so severe at one point that even the light rose scent of my previous go-to, Glossier Milky Jelly, was too much for me. I haven’t touched another water-based cleanser since trying the Matinee and I’m about to use up my first tube of it. Now that I’m less sensitive, I’ll probably switch back to use my last back-up of the Milky Jelly, but after that’s gone, I’m switching to Matinee permanently. The Alkimi Cleansing Melt was less of a love-at-first-sight situation. It’s a perfect example of how “fragrance-free” does not mean “scent-free.” Some “unscented” products actually contain fragrances to mask the scent of the ingredients themselves. Synthetic ingredients sometimes have what people think are “chemical” or “plasticky” smells, and natural ingredients, of course, have their natural smells unless they’ve been heavily refined. The Alkimi cleansing melt is a perfect example of the latter category. The same natural, unrefined oils that give it its beautiful color also impart a mild, earthy smell. Luckily, I did not find it at all unpleasant. Again, I still have one back-up of my old balm cleanser, Clinique Take the Day Off Balm, but as soon as that’s gone, I’m switching over. I’ve talked in the past about how much I love the Klairs Supple Preparation Toner, and the mild herbal scent from the essential oils isn’t terrible, but I was excited to hear that they released a totally-unscented version of the toner. Now, this is a great example of the first category of “fragrance-free does not equal scent-free” because the unscented toner is not scentless. It has a mild “chemical” scent from the components of the product. I think it smells a bit like treated water, but very, very mild. Plus, since it’s not a conscious fragrance, the scent fades very quickly during application. And the toner itself is just as hydrating and soothing as the original. I use a few layers of this in the morning to hydrate, and I use it as a toner step between cleansing and hydrating serum in the evenings. 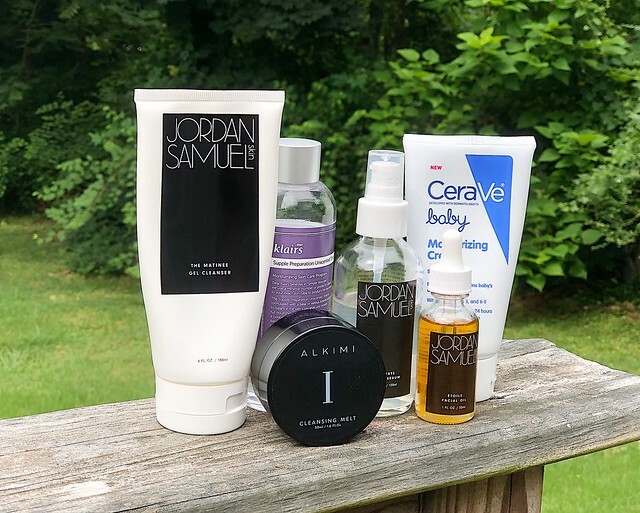 For a hydrating serum, I still use the Jordan Samuel Hydrate serum. Have I mentioned lately how much I love this line? I love that the brand doesn’t put fragrance or essential oils in anything, which is probably why they feature heavily in my routine right now. The serum does have a light, natural scent from the natural aroma of the extracts used, but again, it neither offends my pregnant nose, nor lingers on the skin. And it provides a lovely dose of hydration that’s just a bit more substantial than the toner alone. I generally use two pumps of this after toning at night, but I’ve also been known to apply a pump in the daytime if I’m feeling particularly parched. For nourishment, I go for oils and emollients. Again, this category features an entry from Jordan Samuel Skin, plus another old favorite. Nothing in this category is anything but familiar to those who have read my most recent routine post, and followed my Instagram routine posts. My facial oil is the lovely Jordan Samuel Etoile oil and my moisturizer is a nice layer of CeraVe Baby Moisturizing Cream. The Etoile facial oil is beautiful, not too lightweight but not too heavy. I use it pretty much only at night (although a pump of Hydrate and two drops of Etoile mixed together and patted on after morning cleansing give wonderful glow and I sometimes use that when I need to refresh before going out at night, since everyone expects me to be glowing now) after my other serums but before my final moisturizing step. In a pinch, I can use Matinee, Hydrate, and Etoile with nothing else as a simplified, “I’m too exhausted to do anything before falling into bed” routine. In fact, when I was at the height of first trimester sickness and exhaustion, I actually moved my Hydrate and Etoile upstairs to my bedside table so I could apply them after falling into bed in a bit of a stupor. That said, my skin has been dry enough that, even in the humidity we’ve had recently, I’ve still been finishing my evening routine with a generous blob (maybe chickpea-sized) of CeraVe Baby Cream. I love this over the original because 1.) it comes in a tube, and 2.) it feels slightly less greasy on the skin. I also use a smaller dab (maybe pea- or lentil-sized) dab of this under my mineral sunscreen in the mornings. It’s soothing, protective, and the ceramides are supposed to be good for my skin. And it is utterly scentless. Of course, I forgot to include my sunscreen in the photo above, but I’m still using and loving the Make P:rem Blue Ray Sun Cream every day. It’s mineral and gentle and has a very, very light herbal scent and little white cast. I even have it on the word of a darker-skinned friend of mine on Instagram that she also doesn’t notice a white cast, since, at a NC-20, I’m not the best judge of sunscreen residue. A quick wash with Matinee, a few layers of Klairs, a dab of Cerave, and a slather of Prem sunscreen and I can be out the door double-quick, without offending my sensitive skin or my sensitive nose.